Honoring the Life and Legacy of Dr. Martin Luther King, Jr., 4/4/18. 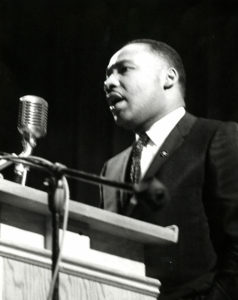 Dr. Martin Luther King, Jr. speaks at Drew in 1964. On the 50th anniversary of his death, we honor the life and legacy of Dr. Martin Luther King, Jr. and reflect on his monumental struggle and influence. On February 5, 1964, Drew proudly welcomed Dr. King to campus where he shared his thoughts with our community in a speech, “The American Dream.” To this day, we are honored to have played even a small role in his historic leadership. Please click here to listen to a clip or here to read the full transcript. We continue to heed Dr. King’s call through our dedication to educating the next generation of impactful leaders. For example, our Freedom School is designed to expand understanding of social justice and equip the Drew community with practical training in non-violent resistance and community organizing, our Black History Month programming celebrates King’s ideals through more than a dozen on-campus and off-campus events and our Civic Scholars Program instills leadership skills in students who take courses in the community and complete 100 hours or more of community service a year. You are welcome to join this week’s chapel service which will begin with a remembrance of Dr. King through the lighting of candles, a reading and singing one of his favorite hymns.